Long-term outcomes after high-energy open tibial fractures: Is a salvaged limb superior to prosthesis in terms of physical function and quality of life? 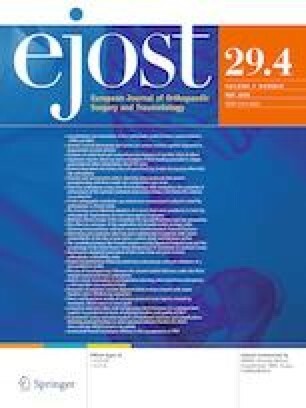 The aim of this study was to describe complication rates and long-term functional outcomes among patients with amputated versus reconstructed limb after high-energy open tibial fractures. Patients treated operatively for a high-energy open tibial fracture, classified as Gustilo–Anderson (GA) grade 3, at our hospital in the time period 2004–2013 were invited to a clinical and radiographic follow-up at minimum 2 years after injury. Eighty-two patients with 87 GA grade 3 fractures were included. There were 39 type GA 3A, 34 GA 3B, and 14 GA 3C. The GA 3A reconstruction group had the lowest complication rate and the best long-term outcome scores at mean 5 years (range 2–8 years) after injury. Within the group of GA 3B and 3C fractures, we found no significant differences in long-term outcomes among patients with reconstructed versus amputated limbs. The mean physical component summary score of the SF-36 in the reconstruction versus amputation group was 54.2 (95% CI 46.3–62.1) versus 47.7 (95% CI 32.6–62.2), respectively (p = 0.524), while the mean mental component summary score was 63.7 (95% CI 50.6–71.8) versus 59.2 (95% CI 48.8–68.0), respectively (p = 0.603). On the 6-minute walk test, the reconstruction group walked on average 493 m (95% CI 447–535 m) versus 449 m (95% CI 384–518 m) in the amputation group. The return to work rate was 73% (16 of 22) in the reconstruction group versus 50% (7 of 14) in the amputation group (p = 0.166). The mean patient satisfaction score (VAS 0–100) was 67 (95% CI 67–77) in the reconstruction group versus 65 (95% CI 51–76) in the amputation group (p = 0.795). Regardless of the treatment strategy, the complication rate was high. Amputation should be considered as a viable treatment option, equal to limb salvage, after high-energy open tibial fracture with severe vascular damage or soft tissue loss. The authors would like to thank Anne Christin Brekke for assistance with coordinating and testing, and Olav Søvik Eken for constructive and valuable feedback on the final manuscript. CF, JCJ, JEM, GF, FF, GSA and TB contributed to study conception, design, and methodology. CF, JCJ and TB coordinated the study, performed the clinical assessments, and analyzed the data. CF and TB wrote the first draft of the paper, and all authors contributed to the final manuscript.